Time for another Random Dozen! No, but I have had several run-ins with the "video rental police". They keep calling and wanting their copy of "Smokey & The Bandit 4" back. Since the majority of my gift-wrapping happens in the car on the way to whatever event I'm going to, I'm going to have to answer "as needed"
My husband's cousin's 3rd wedding. does typing in a word on the google search bar to see how it comes up count as using a dictionary? Shoney's Breakfast Buffet...if it's under a sneeze guard, it's my favorite. got something in the mail this week actually, the laptop lap pillow thing...the one with the convient cup holder and flexible reading light! I got 2 laptop lap pillow things for the amazing low, low price of only $29.95! Why? What have you heard? I don't have any idea what you're talking about...window? what window? 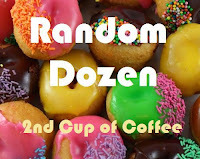 I've enjoyed reading your responses to Random Dozen. It's a terrific meme. I've always liked a good meme and now I have started my own. We just started a new meme called "Wednesday Wickedness" and will post on Tuesday afternoons. You are welcome to do it on Tuesdays, if you do only one meme a day! We are up and posted now. Each week we pick a famous person and find 10 quotes. Then each question is based on the quotes! This week is George Clooney. Check us out at http://jjatww.blogspot.com. Ok Deb, I have actually started using the google search bar for spellings recently! It's much quicker than waiting for dictionary.com to come up! Ha! ~ And how cool would a big boy cake be!~ You had me laughing again with this post! Heehee! I LOVE your answers! Thank you for the smiles! :-) I'm your newest follower! Loved #3! Nice to meet you!